From a local's point of view, there are local San Diego landmarks -- places and things that in some way or another signify the essence and character of San Diego. Now, we don't mean your obvious, popular tourist attractions or destinations such as Sea World or the San Diego Zoo. Or even areas like the Gaslamp Quarter or Old Town. What we're talking about here are entities which call out your attention while traveling through the city. For visitors, it's exemplified by the "What's that?" factor -- when you see it, it piques your curiosity to learn more about it. Here's a list of some of San Diego's more attention-grabbing landmarks. 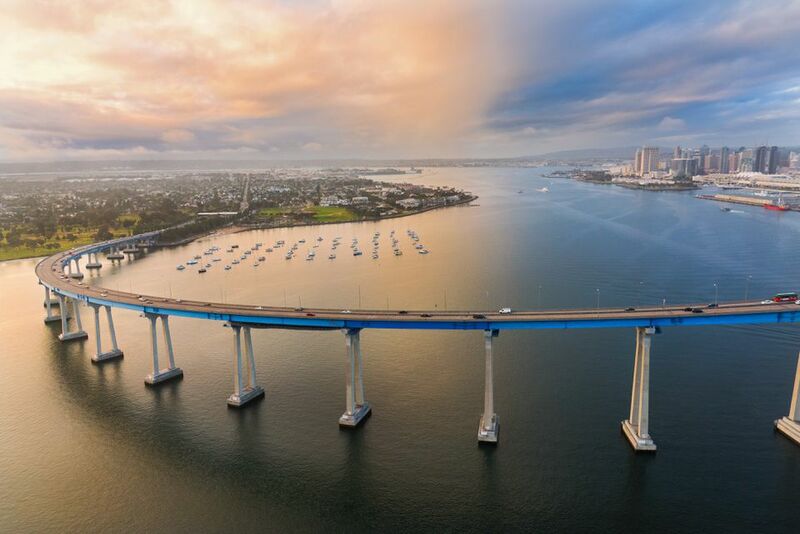 This graceful, sweeping blue span is the major point of access to the sights of Coronado and the North Island Naval Air Station. The toll-free bridge provides one of the grandest views of the city and bay from anywhere for merely the price of gas. Just remember, there's no stopping on the bridge. This beautiful bell tower in Balboa Park (and part of the Museum of Man) is usually at the forefront of what captures the attention of visitors to the massive San Diego park. With its beautiful and ornate tile covered campanile, it evokes the Spanish Moor architecture that pervades this region. This 800-foot hill with the cross atop it in the La Jolla area of San Diego provides a 360-degree view of the city and the Pacific Ocean. Accessible by a winding road, the mountaintop has parking and a grassy area for picnics, starting a run along nearby trails, or simply taking in the breathtaking view. Mount Helix is the East County counterpart to Mount Soledad on the coast: a high promontory adorned with a cross at its peak seen from Interstate 8 and accessible by a winding road in the exclusive residential area of Mt. Helix. It also offers 360-degree views of the eastern part of San Diego County. The amphitheater at the top of the mountain is used for theatrical presentations and popular Easter sunrise services. It looks like something straight out of fantasy land -- or a science fiction movie. With its pointed spires and gleaming white facade, the Mormon Temple generates double and triple takes from motorists traveling on Interstate 5 through the La Jolla area. Only accessible by Latter-Day Saints Church members, this gleaming white structure has become a San Diego landmark by sheer virtue of its magnificent presence. You see them while downtown, crossing the San Diego Riverbed, speeding by as you're caught in freeway gridlock: it's the San Diego Trolley. San Diego may not have a subway system like New York City, but we have our bright red trolley system. With its major hub in downtown and branching off both to the south all the way to the U.S.-Mexico border, and through Mission Valley to the east to Santee, the San Diego Trolley is a popular mode of public transportation and as much a symbol of San Diego as red tile roofs. In honor of Juan Rodriguez Cabrillo, who sailed into what is now San Diego Bay in 1542, this National Park is situated at the tip of Point Loma, a long, scenic peninsula that forms San Diego Bay. The park offers one of the most incredible views of the harbor, Pacific Ocean, and downtown, and you can get some history to go along with the view at the visitors center and old Lighthouse.